I’ve highlighted four championships because those are the two longest droughts in Yankee history. 1962-1977 and 1978-1996. 14 seasons and 17 seasons respectively, without winning a championship. What interesting about that? Well, the Yankees haven’t won a championship since 2000. That’s 8 seasons without a championship and it’s also the third longest Yankee drought in history. It’s time to win another. The pieces are there and the Yankees have all of the advantages. Go out there and do it! GO YANKEES! A couple of hours after the Yankees clinched their first division title since 2006, they are faced with a decision. They have some time, but there definitely needs to be some thought being put into to this now if your the Yankees. That decision is for the format of the ALDS. As the team with the best record, the Yankees will get to decide whether they want two off days or three off days. Both have their benefits. Lets look at them. – You can go with 3 starters on normal rest and skip Joba. – Your bullpen will be rested fully for each game. – Alex Rodriguez can get the rest that his hip needs. – You don’t have to (potentially) face Verlander and Jackson twice. That is all assuming that the Tigers win the central division. If the Twins or Rangers make comebacks and thus face off against the Yankees, the Yankees will most certainly pick the three off days because neither of those teams have pitchers of the same quality of Verlander or Jackson. Just to make it clear, the Yankees don’t have to make this decision until one hour after they either clinch the division or the opponent is decided, which ever comes later. In this case, they have to wait until the opponent is decided, so they still have time. If the Tigers do, in fact, win their division and face off against the Yankees, I think they should pick the three off days. There are many more benefits to picking that format as I detailed above. As for facing off against Verlander and Jackson twice, I don’t think it’s a big deal. First of all, if they sweep the series, they won’t have to face either of them twice. Plus, a potential game five would be at home where the Yankees have a .705 winning percentage, and they would have C.C. and A.J. (or Pettitte) to oppose respectively. The Yankees would still have a good chance to win either of those games and would have all the other benefits I mentioned. 3 off days is the better choice in my mind. Sit back and relax and wait for the playoffs to begin. Enjoy watching the youngsters. Who cares. But either way they open up a series with the Royals in the final regular season series at the New Yankee Stadium. The probables are Hochevar vs Gaudin. 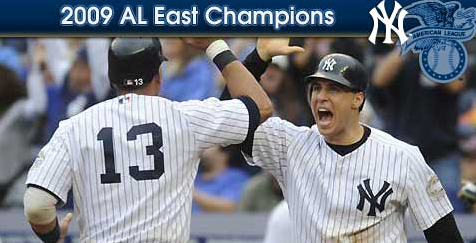 CONGRATULATIONS 2009 NEW YORK YANKEES!!! Here is my newest podcast. It covers analysis of Joba Chamberlains last start in Seattle, what’s next for Joba Chamberlain, what’s wrong with the innings limit and an insight to the Yankees pursuit towards the playoffs. Click the link below to check it out!